The Tabernacle was a sacred structure where God visited the nation of Israel during their wandering in the desert. He commanded them, through Moses, to, "let them make me a sanctuary: that I may dwell among them." (Exodus 25:8). Although it was a tent for portability, it was very ornate, in keeping with the great value placed on God, by the jews. It was divided in two parts, consisting of the "holy" place and the most "holy" place. These rooms were separated by a thick, heavy veil, much like the veil in the temple. 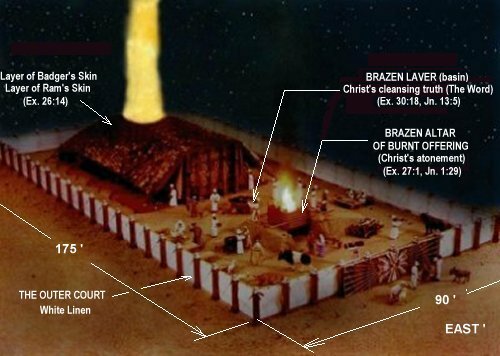 The Holy place was 10 cubits wide, 10 cubits long and 10 cubits high, 10x10x10=1000 as a symbol of the 1,000 year reign of Christ! The tabernacle's total length was about 45 ft. and its width was about 15 ft. It was enclosed in an outer court framed with white linen curtains 8 ft. high, approximately 175 ft. long and 90 ft. wide. The tabernacle was a copy of patterns in the heavens (Heb. 8:2, 9:23). The tabernacle was made of 48 boards covered with gold and dropped into sockets sunk in the sand. There were 20 boards on each side and 8 across the back. 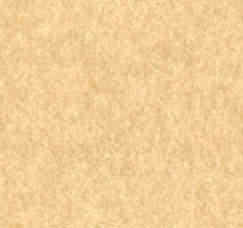 It had no floor but a spectacular ceiling composed of 10 colored sheets of fine-twined linen. Dyed blue (heaven), purple (royalty), and scarlet (sacrifice) and embroidered with figures of the cherubim, they were 42 ft. long and 6 ft. wide. The framework consisted of acacia wood, a desert growth. It represents "a root out of a dry ground" (Is. 53:2). This can be seen as a symbol of Jesus! The tabernacle housed the Bronze Altar, Bronze Laver (basin), Golden Lampstand, Table of Shewbread, Golden Altar, and the Mercy Seat. It consisted of approximately 12 tons (24,000 lb.) of gold, silver and brass (value estimated at $1 million), plus, the weight of the various skin coverings and curtains. So, although considered portable, it took a tremendous amount of people and time to set up, tear down and transport. This task was the responsibility of the Levites (3rd son of Jacob by Leah). Because of their stand on God's side on the day of the Golden Calf episode, they were assigned a holy responsibility (Ex. 32:25-29). As we read in the book of Numbers all of the tribes were numbered except for Levi because of this special work and because they were considered priests for the entire nation. All of the other 12 tribes were numbered according to the number of warriors, which were males 20 years or older, but not too old to fight. God, through Moses, painstakenly recorded the number of each tribe in Numbers 2. Why did he do this? Chuck Missler has a theory and my pastor agrees. You can hear Chuck's teaching on June 30, 1998, on the "Mystery of the Lost Ark." 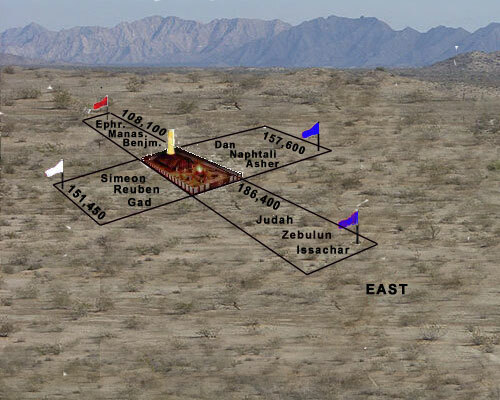 When you visualize how each tribe camped around the Tabernacle, in the desert, based on the numbers of warriors you see an interesting shape! I try to do it justice, below. We have to realize that the priests were dogmatic about when God said camp on the east side of the Tabernacle this meant to stay within the line projected eastwardly from the corner of the fence and parallel to its side. Camping over this line meant you were NE or SE of the Tabernacle. So straight lines would have been formed porportional in length to the population or 186,400 warriors on the East, 157,600 on the North, 108,100 on the West and 151,450 on the South (Nb. 2). This could have been the shape that Satan had to look at, from the air, each time he looked down on the encampment. If you have looked you see the "blessed cross." Now this is assuming the population was proportional to its number of "warriors." It makes for a great teaching, regardless. I can just imagine Satan's disdain for this sight, daily reminding him of his fate, because of what would happen on the cross. The Word is so rich and full of these nuggets, which are so easily glossed over, if read at all! We serve a truly awesome God!